Thief, You've Taken All That Was Me - The Chip's Challenge Wiki - The Chip's Challenge Database that anyone can edit! Search for a thief. Do not get any red keys. Thief, You've Taken All That Was Me is the 147th level in Chip's Challenge Level Pack 1 created by Tyler Sontag. It is one of the Secret levels in CCLP1. As the hint states, do not pick up any red keys or you will not be able to exit the level. To begin, you must grab the suction boots to avoid being hit by the bug. After the bug drowns, go to the southeast corner of the level where you will find the only accessible thief. All other thieves on the way to the southeast corner are surrounded by hidden walls. Once the thief has taken your suction boots, return to the starting point and grab the green key guarded by gliders. 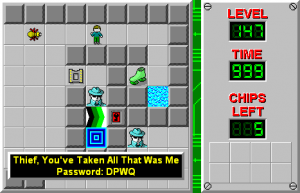 With the green key, you will have access to the remaining rooms where puzzles need to be solved to collect the 5 chips. 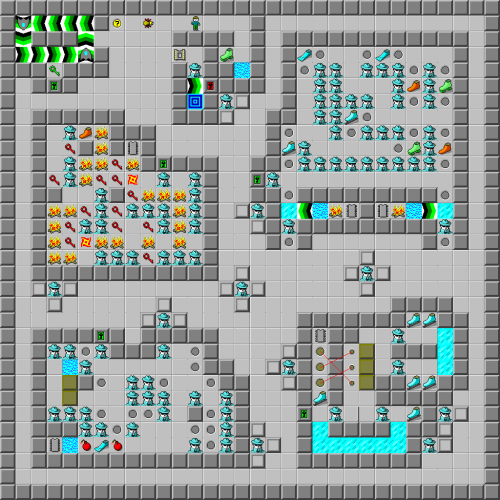 This level is named after the Weezer song of the same name, making it Tyler's second level to be named after a Weezer song. The first is Everybody Get Dangerous, which appeared in CCLP3.